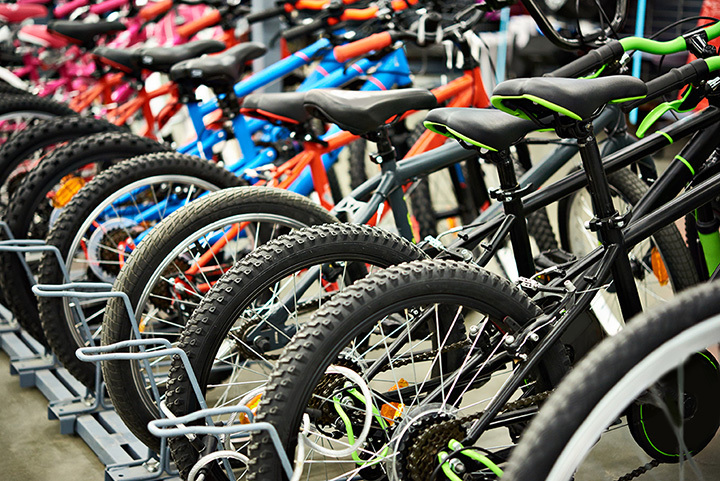 Whether you’re getting your child’s first bicycle or upgrading your own, the many bike shops throughout Florida have you covered. Get out and enjoy the sunshine in The Sunshine State this summer with a cruise down the beach, through a mountain trail, or in a park. Throw the kick-stand down and check out these 10 awesome bike shops in Florida! AJ’s Bikes in Valrico, Florida, only employs bicycle experts, each with the sole mission of helping you find the perfect two-wheel vehicle. AJ’s carries a wide selection of brand name bikes and accessories for every level of rider, including gear and gnarwheels (hand built custom wheel sets). Don’t see what you’re looking for? AJ’s will custom order anything you could want. AJ’s holds regular group rides and other events for riders of all levels. Between the selection, customer service, and dedication, AJ’s stands out. Santos Bike Shop in Ocala, Florida, is conveniently located at the base of the off-road Santos mountain biking trails. Santos sells Cannondale and Giant bicycles, mostly, and has catered to the likes of John Travolta. In addition to selling bikes, Santos rents, repairs, and offers fitting services. Santos also sponsors the Humpday Hustle, which is an annual, five-week mountain bike race series beginning in May. Check the website for exact details and how to get involved in this and other event rides. Orlando, Florida’s Orange Cycle has been in business since 1972, selling bikes, parks, wheels, tires, clothing, helmets, shoes, and other accessories. The brands are far-ranging and include Cannondale, Raleigh, Catrike, Electra, Haro, and Dahon Folding bicycles. The website is a treasure trove of information regarding how to choose a new bike, fitting, and accessories, as well as the best biking areas. Check their site out for the latest summer specials and how to join the several cycling clubs. Clermont Bicycles aims to be the “neighborhood ‘Cheers’ version of a full-service bicycle shop, where everybody knows your name.” Their inventory is large and mostly stocked with Specialized, Liv, and Giant bicycles. You’ll find among them road, tri, fitness, mountain cruisers, hybrids, and adult trikes. Repairs and overhauls are available, as are rentals. Check their website to browse current inventory and sales. Tri Bike Run specializes in running, swimming, and cycling equipment. Tri typically stocks Trek and Cervelo bikes of the city, mountain, road, and youth variety. Services include fitting and bike rental. In addition, Tri Bike Run employees offer training opportunities, including Couch to 5K programs and bike riding groups. Tri hosts and sponsors many events throughout the year, so make sure to stop by their social media pages to keep up to date. Trek Bicycle Store is one of the most successful bike shops in Florida, having been recognized as one of “America’s Best Bike Shops” for four years in a row. With nine Florida locations, including Estero, Naples, Fort Myers, Cape Coral, Sunrise, Fort Lauderdale, Boynton Beach, and Boca Raton means you’ll never have to trek far without a Trek location. Trek offers a 60-day test ride guarantee, lifetime frame replacements, and free tune-ups for a year. Peruse their enormous selection online or stop by any one of their locations to see what all the fuss is about. Downtown Bicycles in Fort Lauderdale, Florida, sells helmets, bicycles, clothing, shoes, lights, tires, car racks, and even computers to enhance your ride. You can shop 24/7 on their website or stop in their brick and mortar store most days from 10 a.m.-7 p.m. (with weekend hours differing slightly). Rides and events are a Downtown Bicycle staple, with events scheduled almost every day of the month. Check their website for community information, tons of free biking info, and to see what they’ve got in stock. The Bike Shop in Ormond Beach, Florida carries mountain bikes, race bikes, beach cruisers, BMX bikes, tandem bikes, kid’s bikes, and road bikes, in addition to cycling apparel and accessories. Their wide range of brand variety includes Comotion, Eastern Bikes, Electra, Fat Sand Bikes, Felt, Fit Bike, Haro, Kink BMX, Sun Bicycles, and more. For a complete list of their bicycle, component, and accessory partners, check their website under the “Products” tab. Infinity Bike Shop in Melbourne, Florida, was founded in 2010 as a full-service bicycle shop. Brands include Eddy Merckx, Felt, Scott, Sun Bicycles, Surly, Tern, KHS, and 3G. In addition to offering some of the best customer service and brands, Infinity throws regular events, such as their Le Tour de France party and sale. Rentals are available, too. The Electric Bike Shop in Port Saint Lucie, Florida, specializes in electronic bikes, selling “the absolute best and most reliable electric bicycles on the market!” Brands include Emojo, Magnum, Populo, Prodeco Tech, among others. For those that don’t know, an electronic bike, or an e-bike, is a bicycle with an electric motor integrated inside that is used for propulsion. They are typically a bit more expensive, but retain the ability to be pedaled as regular bikes. The Electric Bike Shop has sold e-bikes exclusively since 2008.